A POSITIVE attacking display by Dumbarton against SPFL Championship leaders Dundee at a chilly and wet Dens Park went unrewarded. A crowd of almost 4,500 saw Ian Murray's men give a fine performance, but still go down 3-0 to John Brown's side who did not deserve such a margin of victory. The visitors gave as good as they got in the first half, with good early chances falling to Bryan Prunty and Garry Fleming. But home keeper Kyle Letheren was in fine form and foiled every attempt except one — and a defender cleared that Fleming effort off the line. Half-time arrived after 45 minutes of end to end play but no goals, but that was to change after the interval. 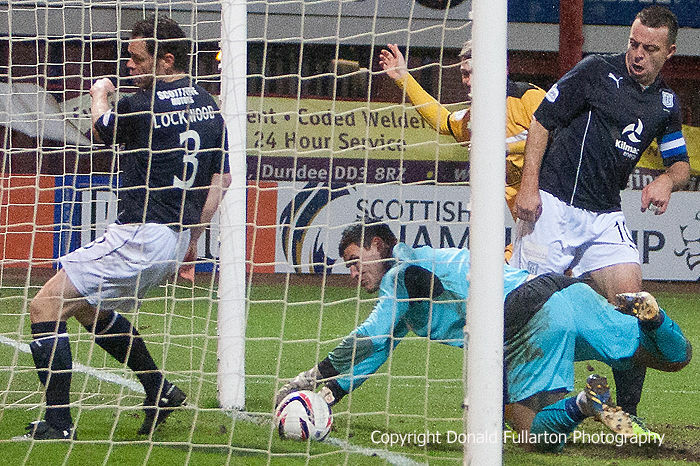 Sons continued to attack, but then conceded a breakaway goal to alert ex-Morton striker Peter MacDonald. Soon after came the moment which had a huge effect on the game. A powerful Fleming header crossed the line, but keeper Letheren scooped the ball back (pictured above), and both the referee and his assistant failed to spot that the ball had crossed the line. To add insult to injury Kevin McBride netted a fine second for the Tayside men before a clearly offside Peter MacDonald ended yet another breakaway with a good shot past keeper Jamie Ewings for no.3. If this sort of luck continues for them, Bomber Brown's men look a cert for the league title.